With her “Windows” series, Betsy Baker gives us a stunning view of a growing trend in polymer (via DailyArtMuse.com). The window metaphor is a powerful one. It suggests something not entirely visible and a bit beyond our grasp. Arden Bardol features them in her “Connections” series shown at the right. Lori Wilkes gives the design a more literal interpretation with her “Metaphor Doors” and window pendants. “They are glassed-in spaces through which we see everyday life. They also serve as portals to the world within,” says Lori. Love these pieces! Such inspiring designs. Thanks for sharing. All lovely! I have always been particularly drawn to Betsy’s work, which is elegant and funky and organic all at the same time. Beautiful!!! Betsy Baker’s work evolves continually, and each evolution amazes! LOVE LOVE LOVE the Betsy Baker’s windows… They are just perfect ! Wonderful! Windows indeed are great inspiration. It is so interesting to see how different artists see it differently. 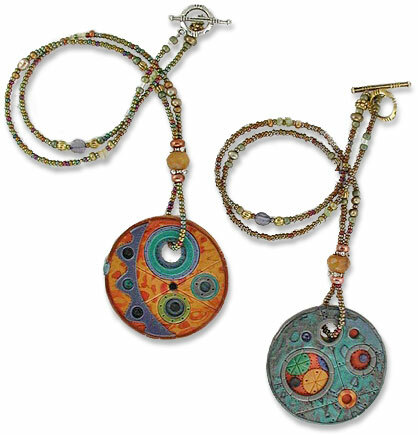 Some time ago, I had my own “window moment” and created a pendant and earrings “Through the window I see life” (can see it on Flickr or on my site). There are so many options with windows…. Fantastic pieces and really terrific websites too! I just want to start creating when I visit your blog, so much yummy images and projects. Love the bird with a human head. Cool stuff!